Amish pop up in the news all the time, but we can’t always do full posts on every story. So today we’ll briefly cover 5 of them. I’ve also shared some of my favorite recent reader comments at the end of this post. So here’s a new type of post to get you caught up. Hope you enjoy, and if you like this, we’ll keep doing it. The family was installing power lines for the Troy restaurant’s new digital signs Wednesday, even though the family cannot use electricity around their own home. “For construction we can use power tools, and I have a flip phone, but we cannot use it around our home,” Schwartz said. But do the Schwartzes grab Big Macs on their lunch break? Like many Americans, some Amish people have a soft spot for fast food. 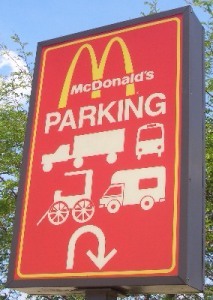 So don’t be surprised to see hitching posts outside McDonald’s and other restaurants in Amish communities. 2. Four Burglary Suspects Caught – Four people targeting Amish homes for burglary in Knox County, Ohio were arrested. Amish are often targeted as they are seen as easier prey for those wanting quick cash and minimal risk of retaliation. However, many are not just passively accepting being targets. Amish have cooperated with police and this is hardly the first time people have been caught for this. Sadly, often drugs are involved and that seems to be the case here with these suspects, 2 men and 2 women who range in age from 18-24. 3. Amish Farrier on PEI – Perry Kuepfer is an Amish farrier in the young settlement on Prince Edward Island. Just what is a farrier, you might be wondering? These guys are important in Amish communities because they keep the horses’ hooves in working order. Farriers trim and shoe hooves, and this is not often an easy task. Greenan, the owner of Emerald Isle Carriage Tours, is one of a growing number of Islanders who are hiring Kuepfer for his expertise with horses. Kuepfer works six days a week in the summer — never on Sunday — and his services have become so much in demand that he has had to turn people away. He not only shoes most of the buggy horses for the Amish community in eastern P.E.I., but also hundreds of racehorses and and draft horses from around the Maritimes. Perry’s been a farrier for about 16 years. To get horses used to being shoed, he suggests “Start picking up their feet when they’re little, they get used to it.” Perry likes living on Prince Edward Island, which he describes as “more laid back” than Ontario. Stassek said he sprung into action. Abbott said the Amish and drivers share 46th Street daily. Thankfully, the man survived, though the horse did not. 5. Bupli Soup – Ever tried it? This simple soup features in a recent Amish Cook column. Bupli means “baby” in English, Gloria Yoder explains. But she says it is also known to her as “church soup” as it was what her church ate in Ohio after service. There are just four ingredients – butter, milk, bread, and salt. You can find the full column and recipe here. And finally, your comments. With over 2,000 posts going back 10+ years we get a lot of comments on this site, frequently on older posts, which people might miss. Dana wonders why there are not more Amish in West Virginia, while Kathy Kimble shares that a new settlement is being established in Grant County, WV, with 200 Amish expected from New York. Kelly Weaver’s father has a postcard from 1911 confirming his subscription to the Budget newspaper. Annual subscription cost at the time? 20 cents. Amish-raised Marie Graber comments on the high-gloss paint on an Amish home’s ceiling. I tend to agree…we have more choices than we sometimes realize. But those choices can be complex. I visited a lively 94 year old today who had her tablet close. She’s on social media regularly because it allows her to kept in touch with her many descendants, located far and near. She seems to be managing her use of social media in a way that fits her values and lifestyle. She didn’t keep checking her messages during our visit, but she did show us pictures. These choices do not have to become zero sum games. One of the things I enjoy about the Amish is their discipline. Decisions actually are made thoughtfully. What we think is weird can actually make sense if we engage our brains and focus on what our values are. A phone in a booth at the end of the driveway is about managing technology. Why do we not think about where we will keep our smartphones? The well-traveled and always-knowledgeable Al in KY shares an update on the Lagrange/Elkhart County settlement. Generally the Amish become more plain as you go east in this community. But there is one island of plainness called the Barrens not far from Shipshewana. Lori updates us on the Whitefield, Maine Amish community, with a rundown on what the farmers and businesses are selling. Handmade yeast bread, cantaloupe, watermelon, quilts, straw hats, and outhouses are all to be had. Richard Traunero shares his friendship with a Lancaster Old Order Amish couple. Tammy praises the work of Amish midwives. 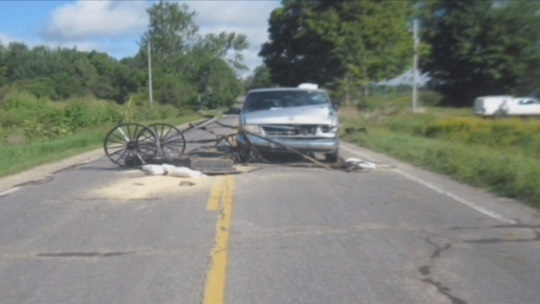 Linda Chaney had a close call on the road in Lafargeville, NY, and wonders why the buggies aren’t better marked. identical to a traditional & not uncommon Shabbos (Sabbath) “grandmother” dish for Yiddish Jews. It fulfills & adheres to the OT Kosher laws of keeping milk dishes separate from meat dishes. aside, it is delicious & often the first cooking lesson for kinder. Tho we have always “known” it to be an Iberian Jewish dish for Shabbat (Ladino vs Yiddish). a standard dish in American South, especially among mestizos, Melungeons etc. & yes, usually the first cooking training for mihas or youngins. & beans being a native Southern veggie, that part is an American addition. Why don’t we have Amish settle in Australia?? I wonder the same about New Zealand. Though I guess the main reason is that when the first Amish and Mennonite settlers left Europe was before New Zealand was ready to be settled. It would be long way for them to go now, though I believe it would suit them here. This is a great idea Eric! I hope you do more like this. Love this recap of articles and comments – very nice. Glad you liked it Lee Annette, might do it again!